THE B-MOVIE NEWS VAULT: The MVD Rewind Collection Continues to Impress With Their New Special Edition Blu-ray of BLACK EAGLE! The MVD Rewind Collection Continues to Impress With Their New Special Edition Blu-ray of BLACK EAGLE! 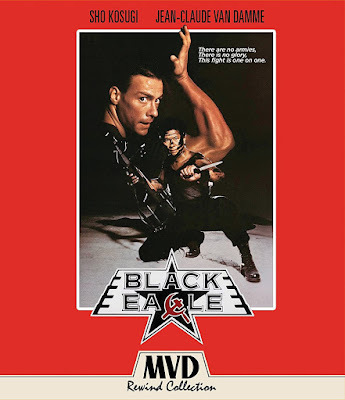 SHO KOSUGI TANGLES WITH JEAN-CLAUDE VAN DAMME IN MVD REWIND COLLECTION'S 2-DISC SPECIAL EDITION OF "BLACK EAGLE!" Thus far, I've missed out on all three of MVD Rewind's inaugural releases (DOA: A RIGHT OF PASSAGE, ATTACK OF THE KILLER TOMATOES, and now BLACK EAGLE), but plan on catching up when I get some expendable income. 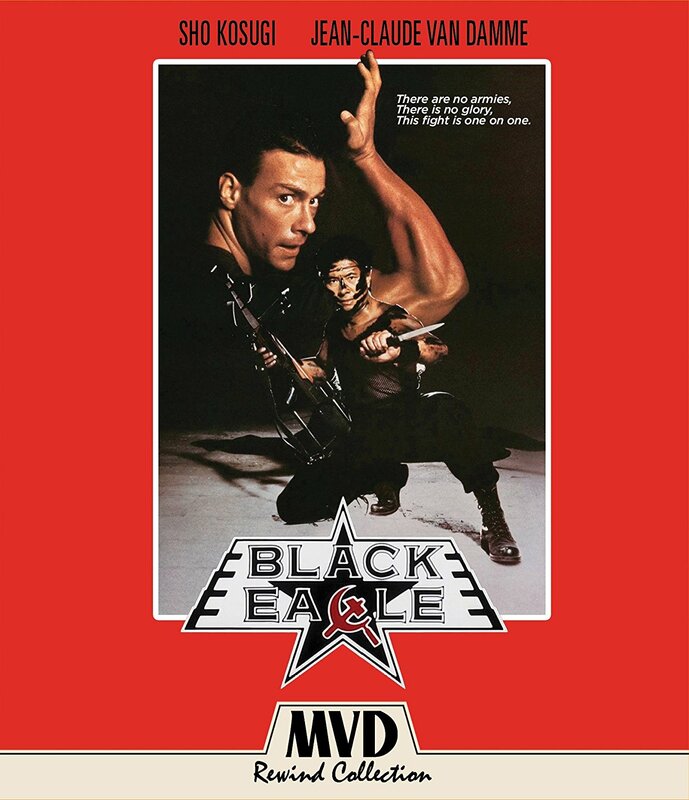 To be honest, I've never seen BLACK EAGLE (shocking as I am an unabashed lover of all things Van Damme), so I'm eager to scope out this disc in the near future! Synopsis: After an F-11 gets shot down over the Mediterranean Sea, The U.S. government cannot afford to lose the top-secret laser tracking device that was on board. 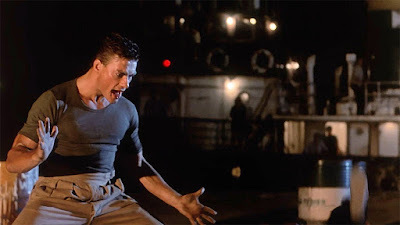 But unfortunately, the KGB team lead by the infamous Andrei (Jean-Claude Van Damme, BLOODSPORT, LIONHEART, UNIVERSAL SOLDIER) are beating the CIA in the race to find it. The CIA has no choice but to call in their best man, master martial-artist Ken Tani (Sho Kosugi, ENTER THE NINJA, REVENGE OF THE NINJA), code name… BLACK EAGLE. In response, the KGB resorts to an all-out war, with powerful Andrei matching Ken blow for blow. From legendary action director Eric Karson (THE OCTAGON), BLACK EAGLE also stars Doran Clark (THE WARRIORS), Bruce French (JURASSIC PARK III), and William Bassett (HOUSE OF 1,000 CORPSES). Jean-Claude Van Damme prepares to high-five his opponent. NEW! Includes 93 minute theatrical version + 104 minute uncut extended version of the film! NEW! Sho Kosugi: Martial Arts Legend (HD, 21:26) - Interviews with Sho Kosugi and Shane Kosugi and more! NEW! The Making of Black Eagle (HD, 35:50) - Interviews with Director / Producer Eric Karson, Screenwriter Michael Gonzalez and stars Sho Kosugi, Doran Clark, Shane Kosugi, and Dorota Puzio! NEW! Tales of Jean-Claude Van Damme (HD, 19:20) - Interviews with cast and crew and their stories about working with the legendary action star! NEW! The Script and the Screenwriters (HD, 27:14) - Interviews featuring Michael Gonzales, Eric Karson, and more! With two cuts of the film, and nearly two hours of bonus content, this has to be the most love any label has ever given BLACK EAGLE! MVD Rewind's 2-Disc Special Edition of this title is currently available wherever discs are sold, and ranges from $25 - $30. You can order a copy now from AMAZON, BULLMOOSE, or DIABOLIK DVD!